The Hard Ocean Water cocktail was inspired by the Ocean Water beverage sold at Sonic’s drive-in – Christina at Modern Bonvivant wanted to create a grown-up version of this unique flavor. Instead of coconut rum, she chose a newer and lighter option – coconut vodka. The most prominent taste in this drink is coconut, but it’s not at all cloying. 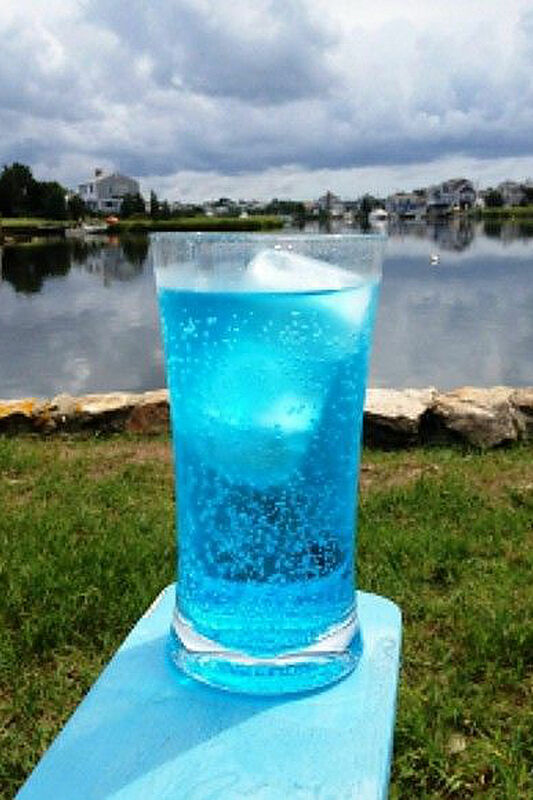 The blue curaçao is for color more than flavor, and the citrus from the lemon lime soda is also surprisingly subdued, serving more to mellow the coconut than to change the flavor. This is a light, refreshing drink ideal for a hot summer afternoon. It’s not designed to be sophisticated – it doesn’t layer complex flavors. But that’s the beauty of it – it’s simple, tasty and gorgeous – perfect for a day at the beach, or a day when you wish you were at the beach. In a tall Collins glass add ice and pour the blue Curacao, then the infused vodka over the ice. Top with Sprite or lemon lime soda and give it a stir to combine. I can’t recommend anything, sorry. Liquors don’t list their ingredients, so I would have to assume anything coconut flavored will trigger your allergies, and coconut is the main flavor to this drink. I’ll try UV Blue Raspberry vodka and see if that works. That sounds good! I thought you were after something coconut flavored, LOL.